Back in June 2017, it was officially announced by IKEA that this year Ikea Art Event 2018 have prepared a limited-edition series and IKEA has invited artists Arkiv Vilmansa, Coarse, James Jarvis, Joe Ledbetter, Junko Mizuno, Ludvig Löfgren, Michael Lau and Nathan Jurevicius! All the glass figurines made at Målerås glass factory in southern Sweden to create contemporary glass figurines. Over the last 48 hours news has spread like wildfire that some IKEA locations in the U.S.A have begun to showcase them and stock them. With a couple more weeks until the official launch ETA April, we suggest checking out your local IKEA to see if they have them. “We want to celebrate the amazing world of art collectables and the imaginative universe connected to figurines, how they spark our fantasy, represent everyday and turn it upside down with fun and playfulness,” says Henrik Most, Creative Leader for the upcoming collection. Japan, Hong Kong, China, Indonesia, South Korea, USA, Canada, Germany, France, UK, Italy, Spain and Sweden. Availability depends on the area you live. Some locations/ online IKEA stores may/may not have them. We have just given IKEA U.K a call an so far no stores around our area have them yet, but the helpful IKEA employee did say they should be released 2nd of April in the UK due to the fact Apil 1st would be Easter Sunday. 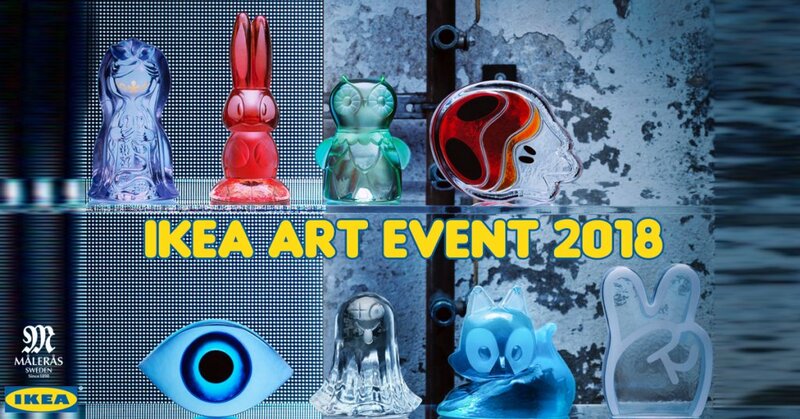 Please contact your local IKEA store or their online store directly and ask if they’ll have IKEA Art Event 2018 glass figurines. Below is our unboxing of the COARSE, Michael Lau and Junko Mizuno editions. I stopped by the Ikea yesterday to pick some stuff up and was surprised to find a large display setup with these. I picked up the COARSE piece and may have to go back for more. They are currently on shelf at Ikea in Carson, CA.